One of our members had posted about a 2017 reformulation of D. R. Harris hard soaps. I thought that post was here, but it was a response by him to a member on another forum who noticed the change of ingredients and asked about the change. Lo and behold it appears to be true and tallowate is now in the first position. 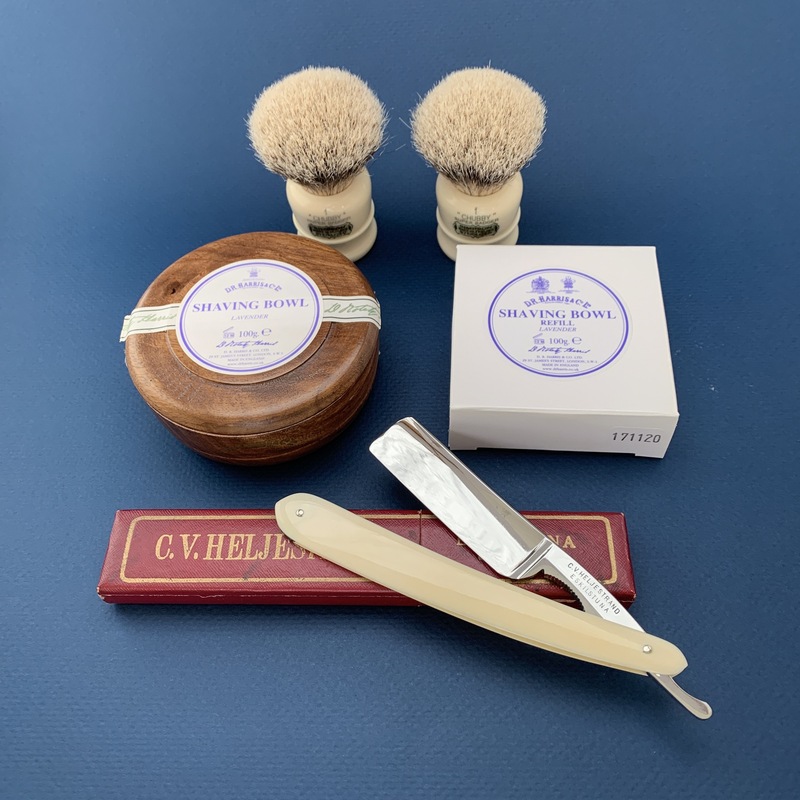 Here are the ingredients of the old and new formulas, along with the Cyril Salter hard soap. Note that Harris and Salter share the first 9 ingredients in the same order, and many of the other ingredients are the same. Truefitt and Hill are also supposed to be reformulating, but I do not have the new T&H ingredients. This information prompted my recent post on Floris soaps, hoping that they will follow suit. Tip o' the hat to Ask4Edge. Apologies for the image quality, I simply took an image of my computer screen with my phone lol. I can add that I used the Cyril Salter this morning and it's excellent. It lathers easily and the lather is slick and stable. Being a Str8 user, I can't comment on cushion or glide. The scent is not far off D. R. Harris lavender when lathered, very nice and smells better when lathered. It's an excellent buy for sure. Great to see this... Steve! Will be ecstatic when T&H release a similar formula. Oh my! While this is true, it will take a long time before vendors have the new formula. My Marlborough is the new formula and my Lavender refills are the new formula but, everything else is old formula. I suspect that I will continue to receive old formula for the next couple of years. A run of soap is huge! Yep, it may take a while to ‘percolate’ through the system, but I think that I’ll order a puck or two to see what the deal is. 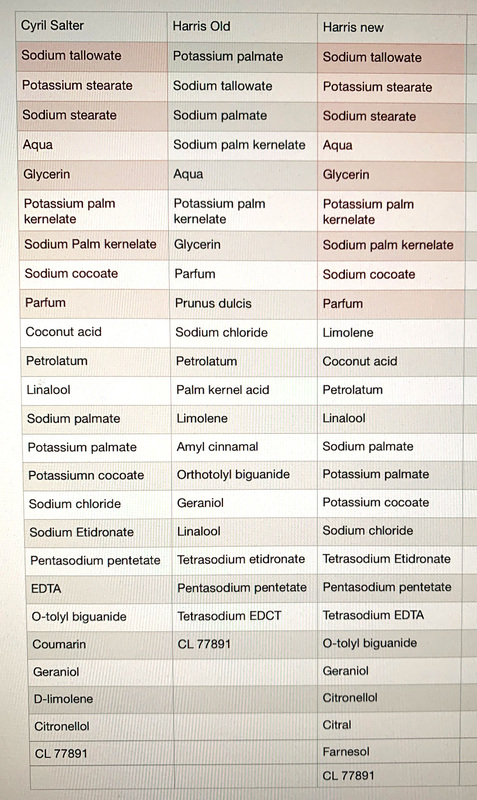 Apparently the reformulation may be to reduce palm oil in the soaps. We must also keep in mind that there may not be a huge or even detectable difference in performance, the old stuff was pretty darned good. Tallow fans will be happy of course, but some of the best lather fuel in the world is non-tallow, MdC, the Italian creams, Dior cream, and so on. The T&H rumor that was discussed was that Apsley hard soap would appear next month in a formulation different from the cureent one. I’ve also noted that many T&H hard soaps seem to be AWOL on the US site. Thanks Steve. Please let us know if performance is improved and/or different from the previous formulation. Will do Phil, I have the old version lavender so it should be a good test. What is this Dior cream you speak of, Steve? (01-18-2019, 08:44 PM)Nero Wrote: What is this Dior cream you speak of, Steve? Yes, do tell. Dior Eau Sauvage? 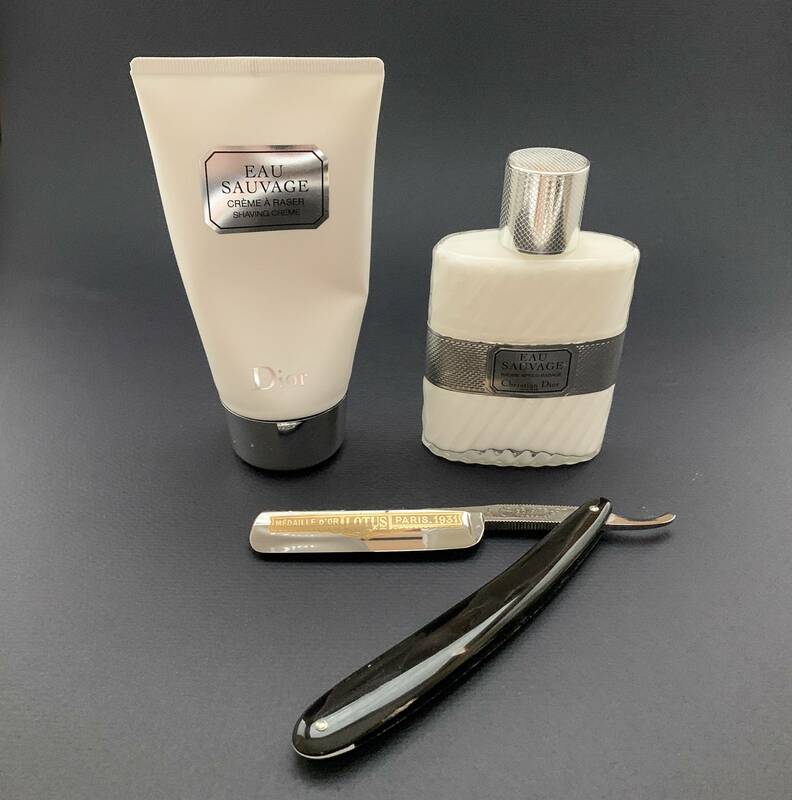 Yes, they make an Eau Sauvage shaving cream and after shave balm. The bad news is that neither is sold in North America and Dior apparently will not let authorized EU dealers ship to NA. So you're stuck with shady high-priced third parties, or as I do, have a friend send me some or pick some up in France when I'm there. It's fine stuff indeed! Too bad about the lanolin.... <- /H Made you look Matt! Lol. 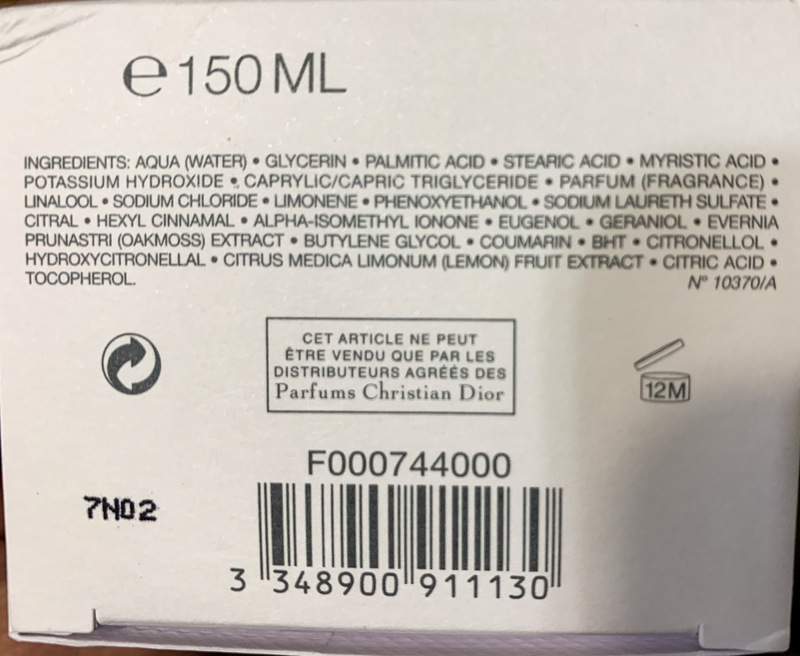 BTW, the box below the ingredients in French says (pretty much) that 'this product cannot be sold except by distributors in agreement with Christian Dior Parfums'. So no soup (soap) for us! Shame, and it isn’t that expensive, you can find the cream for around 25€, maybe a bit less on sale. Did the ‘shootout’ this morning, old D. R. Harris lavender vs new tallowate-first formula, also lavender. TL;DR, I’d agree with Ask4Edge, the tallowate-first version is slightly better in that it loads a little easier, and the lather feels a little ‘creamier’ or richer. The tallowate-first formula is a bit whiter in color. That said, my old puck is pretty dry, so the loading could be just dryness though I wet the surface of both pucks while I was showering. They were both lathered with identical Simpson Chubby 1 Super Badger brushes, the lather was made with distilled water. Slickness was the same as was post-shave feel. Razor was a Heljestrand MK33. Very good! Thanks for the gouge! I really like DR Harris, and I don’t use mine enough! Perhaps tomorrow! (01-18-2019, 10:47 AM)bullgoose Wrote: While this is true, it will take a long time before vendors have the new formula. My Marlborough is the new formula and my Lavender refills are the new formula but, everything else is old formula. I suspect that I will continue to receive old formula for the next couple of years. A run of soap is huge! Your website lists Potassium Palmate as the first ingredient in the DRH Marlborough. Is this a typo? (01-23-2019, 07:53 AM)Steve56 Wrote: Did the ‘shootout’ this morning, old D. R. Harris lavender vs new tallowate-first formula, also lavender. TL;DR, I’d agree with Ask4Edge, the tallowate-first version is slightly better in that it loads a little easier, and the lather feels a little ‘creamier’ or richer. The tallowate-first formula is a bit whiter in color. Thanks for the comparison, Steve, but once I saw the photo, all I could think about was the CVH razor. Wow. What a looker! Probably shaves great, too. OK, no problem. Thanks for the response. Yep, a MK anything in ivory is about as good as it gets. Does anyone know any US-based vendors that have the tallow-first reformulation in stock?